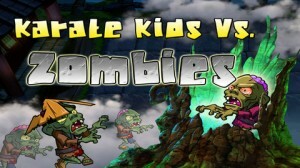 Zombies & Karate Kids iPhone Game Review. Judging by the number of zombie games in the App Store, it looks like zombies are in this season. Whether it's a strategy zombie game, a puzzle, or an arcade, one thing's for sure: you need to kill some zombies today. So grab your guns, find a comfortable position, and let today's battle begin with Zombies & Karate Kids. 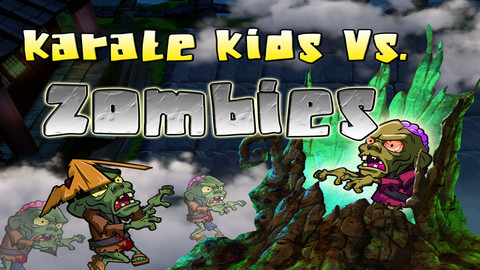 Zombies & Karate Kids is a pretty strategical game, but not so much as to make your brain hurt. The goal is killing zombies, of course. 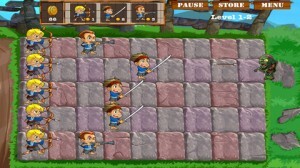 And to do that, you have 3 sorts of karate kids you can use: an archer, a sword fighter, and a shooter. Each one better than the other. But also more expensive to hire in this battle to save the world against zombies. 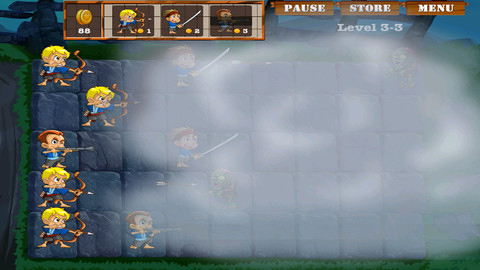 The game is structured on three levels, with each level challenging you for five phases of wave after wave of zombie attacks. 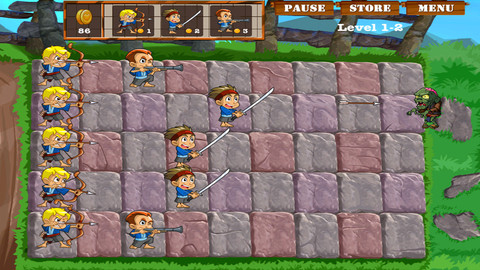 At the beginning of each game, you'll have to position your karate kids in order to stop the zombies from crossing over the battle field. It's a classic castle-defense game when it comes to game play. Each of the karate kids will cost a different amount of coins. You can earn coins for each zombie you kill or buy some via in-app purchases. Now, the biggest problem most people have in life is also the biggest problem with this game: money. You start the game with a small number of coins you must invest in hiring karate kids to fight for you. Plus, you get one coin for every zombie you kill. And that seems fair. But whether you clear the level and move on to the next one, or you lose and you restart the level, your coins remain the same. Restarting a level doesn't give you back the coins you lost. And that really doesn't seem fair. If I clear the level, I don't expect fireworks or anything, but a boost would be nice. Some extra coins, something other than just a pat on the back. During the game, I'd expect to get more coins for killing more powerful zombies, in the same way that more powerful karate kids cost more coins. I don't find it fair for users to have to buy the most expensive fighters to be able to beat the more powerful zombies, and still get the same number of coins as they did for the easier targets. I understand in-app purchases. And I appreciate being able to go on with a game I really like by buying my way through, when I've made a mistake and my skills weren't enough. But in this case, I feel like no matter what you do, and how you plan all this, at some point in the near future you'll need to buy coins to go on with the game. And that's what I don't like. I appreciate it when I am given the option, but I hate it when I am forced to do so. The economics of the game are messed up and this will likely show up once you progress through to the tougher levels. I believe there's something stressful about offering the game for free and then forcing in-app purchases on me. Even if I must admit I got a bit frustrated with Zombies & Karate Kids, this doesn't mean I wouldn't be open to giving it a second chance. That is if it would be more user friendly, and less money oriented. Because Zombies & Karate Kids is challenging. It puts your mind to the test. It's fun. And it felt really good playing it, while it lasted. So, it would be a shame to see such potential go to waste. EDIT:The creators of Zombies & Karate Kids just released a new version of the game. So, a quick update is in order. Especially since the game got, indeed, better. Besides 3 more levels being added, also the coin problem was partly resolved. You still have to make smart choices and save your coins as much as you can. And if you lose your coins, there's no (free of charge) way of going on with the game. But now, for every level you clear, you get a 5 coins bonus. And the difference really shows. Last time I played the game, I barely made it to the second level, and now I almost made it to level 4. So, I guess some congratulations are in order. Good job, guys! What do you think of Zombies & Karate Kids? Scroll down for our comment section and let us know!